Mary O’Rourke is a Physician’s Assistant in the Department of Gastroenterology at the University of Utah and in spite of the free transit pass that she receives as a U of U employee, Mary mounts her trusty steed to get to work most every day between mid-February and mid-November. Why does she do it? Her motivation is pretty simple, “I do it for the exercise and for the environment, and quite honestly, I can get to my office from my house in Sugarhouse quicker by bike than by car.” If that doesn’t get people on their bikes, it’s hard to figure out what will. Mary’s ride is about 4 miles each way and to make sure that the people who aren’t enjoying their bikes see her she’s decked out with a neon yellow jacket with reflective piping on the sleeves, lights on the front and rear of her bike and clip-on, blinking red lights on her panniers. It is hard to miss her as she pedals in the early morning or evening when the light is dim, and the lights and reflectors help her feel more secure when it’s dark. These also allow her to ride to evening social events, where her famously-cheery demeanor always inspires her friends to ride their bikes as well. 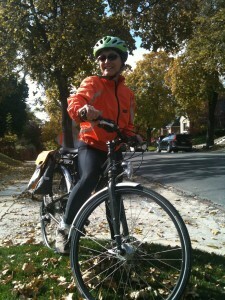 While Mary is one of the most optimistic people on the planet, like most bike commuters, she does experience some struggles with getting on her bike from time to time and Mary admits that when it’s cold and dark, it’s harder to get excited to ride. “Laziness is my biggest struggle”, she says, and “It can be pretty enticing to hop in my car on a dark morning when the temperature is below freezing.” She does indeed commute less frequently in the full winter months of mid-November or so until mid-February, but unlike many folks, she’s actually not impacted as much by the pollution of our winter inversion but rather by potentially-slippery road conditions. Whether your motivation is guilt, joy or lack of choice, why not join Mary each morning in pedaling your bike to work?